Who hasn't had a Rice Krispie treat? At least here in the States, they were in just about every lunch box (remember those bright blue packages?) and at every bake sale. There is a good reason for that. They are heckin' delicious! They are also incredibly addicting. Especially this maple-pecan version I made over the weekend. I told myself I could "try" just one to make sure they turned out well, and next thing I knew I had eaten 4. Even my husband, who is notoriously not a sweets person would grab one every time he walked through the kitchen. Of course, classic Rice Krispie treats are good all by themselves. How can marshmallows and cereal be so good? (Sorry, dumb question. The answer, of course, is sugar.) But, man, these maple pecan Rice Krispie treats are sooooo much better! It's not just because of the maple syrup and pecan pieces. But there are a few things I like to add or change from the classic recipe to really step up my RKT game. The first step in making extra delicious Rice Krispie treats? Brown butter. Since the first step to making RKTs is melting butter, just take a few extra minutes to let it brown a bit. Browning butter is basically the same thing as forgetting you left butter on the stove. Except don't totally forget about it. At a certain point, it will just become burned butter. And that probably doesn't taste very good in RKTs. The next tweak to the classic recipe is to add a flavoring. If I were making basic RKTs, I would add vanilla. Since I made a maple-pecan flavor, I added maple syrup. Adding vanilla or any other flavoring just classes it up a bit. These treats will taste more like they came from a bakery than made from a recipe off of the side of the box. 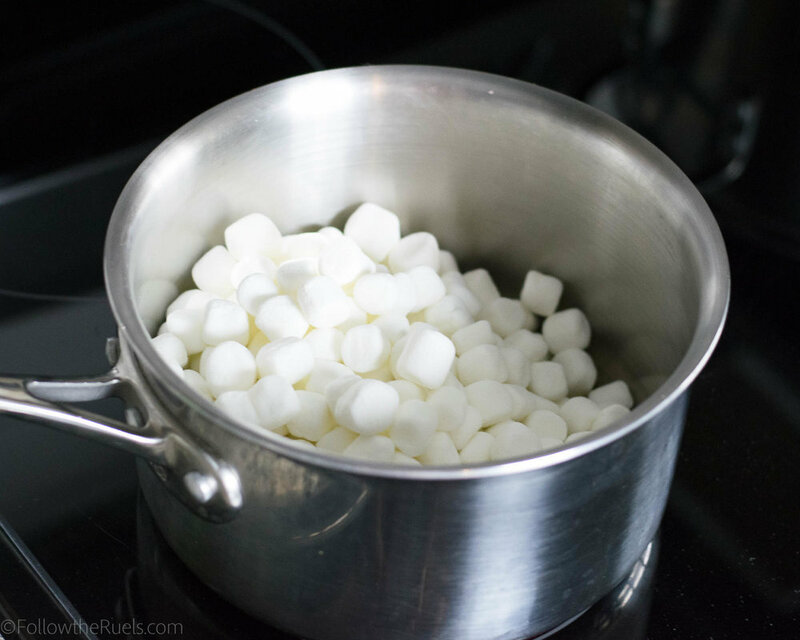 The last little change is to add a dash of salt to the melted marshmallows. Unless you are using salted butter, then do not add salt! The salt helps balance out the sweetness, and trust me, there is a lot of sweetness. For my maple-pecan variety, I also added some pecans. To get that nutty flavor throughout the treats, I processed some of the pecans extra fine then poured them into the melted marshmallows. I also left some bigger chunks of pecans and folded them in with the cereal. At this point in the process, just about all RKT recipes are the same. Dump the coated cereal into a pan and press it down to fill up the dish. Because these treats can be extra sticky, I prefer to line my casserole dish with some parchment paper. I know parchment can be a bit of a pain to work with since it never wants to stay in place in a dish that shape, but it will make clean up so much easier! Like all RKTs, the maple pecan Rice Krispie Treats don't take very long to set. I recommend letting them sit for about 30 minutes before trying to cut them into pieces. If you know you aren't going to be eating them right away, cover them with plastic wrap so that they don't dry out too much. As I mentioned above, these are addictingly good! And they would make an excellent addition to your Thanksgiving dessert line up. Give that pumpkin pie a run for it's money! Prep a large 9x13 casserole dish by spraying with baking spray and lining with parchment. Fight with the parchment for a minute as it tries to curl back into itself. Then just set aside to deal with later. In a large sauce pan, melt butter then bring to a light simmer. Let simmer over medium heat for 5 to 7 minutes. The butter will start to smell rich and fragrant and will turn a nice amber-brown color. Pour the marshmallows, maple syrup, and salt to the butter and stir until marshmallows are melted. Contemplate just spooning the mixture of sugar, syrup, and butter straight into your mouth. Add half of the pecans to the marshmallows and stir just to get them incorporated throughout. Pour marshmallow mixture over cereal in a large bowl. Fold the marshmallows into the cereal until every little piece of cereal is coated and happy. Sprinkle the rest of the pecans into the cereal mixture and give it one last fold. 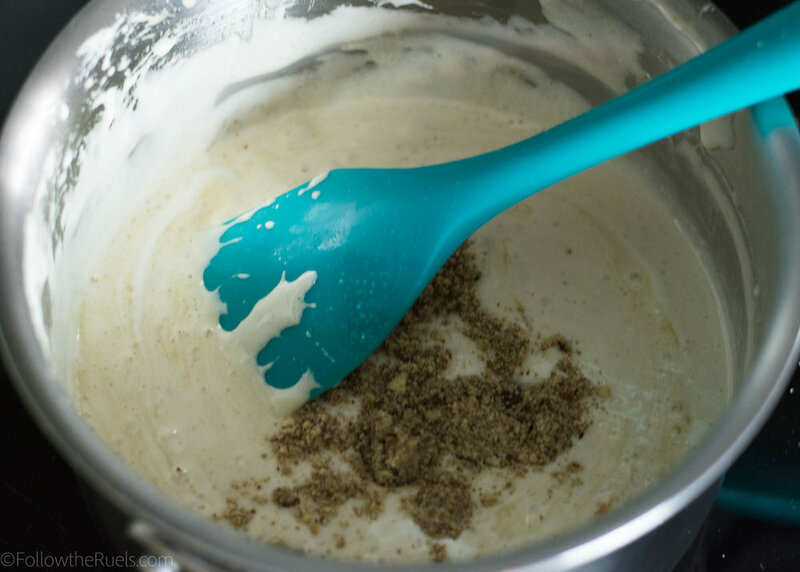 Gracefully transfer the cereal mixture into the prepared pan. And by that I mean, just dump it into the pan. Press the cereal down with a spatula to spread into every nook and cranny. Let cool, and set for at least 30 minutes before cutting. Store in an air-tight container for up to 5 days. If they last that long.